One of my favorite things to do when traveling to a new place is to try the street food. Street food is always an adventure and great way to get to know a place. Usually, it is delicious, cheap and a great way to get other diners talking about their city. Some people have a fear of eating street food but I have tried it all over the world and so far anyway, haven’t had a bit of a problem. I feel safe eating street food because usually kitchen is right there to inspect, ingredients are almost always fresh. Also, if there is a problem you have instant access to the ingredient buyer/maître de/chef/waiter/busboy. What is the Difference Between Elotes and Esquites? 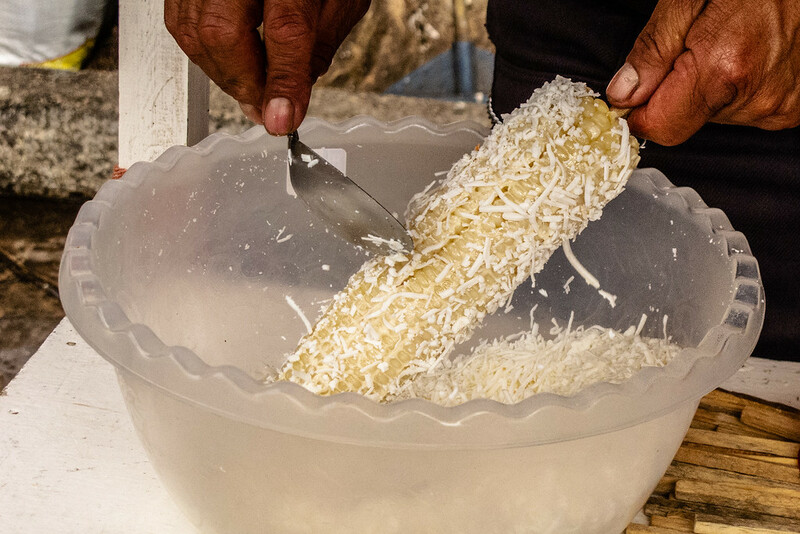 In San Cristóbal de las Casas, Chiapas Mexico one of the more ubiquitous street food items is elotes and its cousin, esquites. An elote is essentially the Mexican name for grilled corn on the cob. It is served on a stick or with the husks pulled down to make a handle. Esquites is essentially the same corn removed from the cob and served in a cup and eaten with a spoon. The recipe calls for fresh corn to be cooked over a grill and then usually held a steamer or ice chest on the street cart to keep warm. Then when you order these delicious missiles of gastronomic goodness they are almost always slathered with mayonnaise. Optionally there is salt, chili powder, butter, salsa picante, grated cotija cheese, or lime juice or sour cream. I like the mayonnaise, cheese, salt, and lime. Granted eating anything on a stick, out of a tray with plastic forks, from paper or a husk is usually not too elegant but elegance is not what street food is about. Street food is about flavor; both of cuisine and place. It is social: how often do you get to share a table with an entire city? It is usually inexpensive and a culinary adventure. Just be sure to get lots of napkins. Yummy! I just don’t know about that salsa on the corn on the cob, but it sure looks and sounds good!! !n nLike you, we don’t worry too much about street food since everything is right there on display and you can make an informed decision on the spot!! I also love street food. 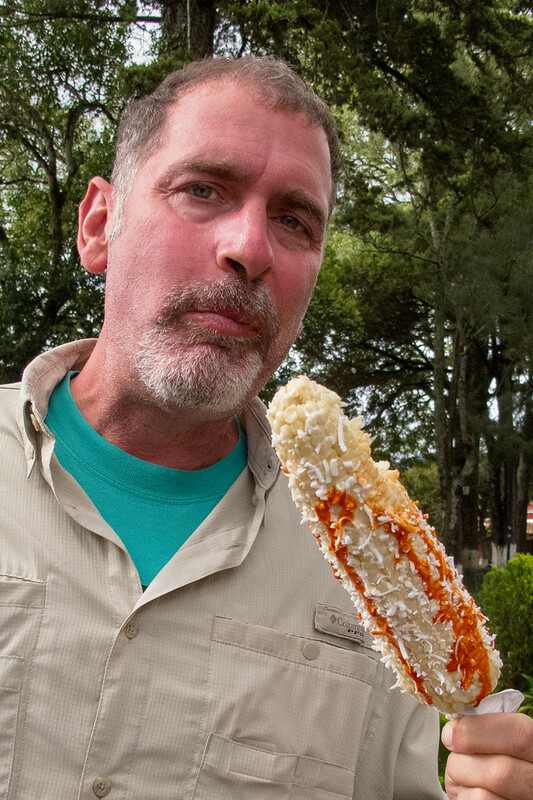 But so much good street food in San Cristobal, I would hope you tried more than the elote which is common most anywhere in Mexico. I tried this in El Salvador. Disgusting!